Routine evaluation of the health status of cattle is important to ensure that your animals are comfortable and productive. Visual appraisal of body condition scores (BCS), fly stress, and signs & symptoms of sickness are easily observed as you walk through pastures or move cattle through your working facilities on a regular basis. There is one area that can sometimes go overlooked as you evaluate the general condition of your cattle, and that’s the feet & legs. A cow’s mobility is crucial for its health, productivity, and longevity in the herd. Cattle have to be able to travel on their own as they move across a pasture to graze, to find water, to breed, and calve without assistance. Let’s start at the bottom with the hooves. The hooves are one of the most important parts of the cow’s body, because without these, the animal cannot travel, exercise, graze, or reproduce. Hooves grow very similar to the human nail, and the integrity and frequency of growth has several factors such as diet, reproductive state, living conditions and general wear and tear. Evidence of growth can be evaluated by the growth rings on the wall of the hoof, as shown in the photo below. The hoof wall and sole are the most exposed areas of the foot that are at risk for injury and issues, and should be evaluated regularly for problems. A couple of the most common foot/hoof related issues that we see are foot rot and hoof cracks. Normal healthy skin between the hooves provides protection from bacteria entering under the skin and causing inflammation. Foot rot is caused by the continual exposure to wet, muddy conditions that irritate and cause puncture points for bacteria to enter. Rough surfaces such as freshly cut grass stubble, rocks and stones, uneven concrete, or hardened sand can also increase the incidence of foot rot. In areas of high humidity and temperatures, skin is prone to chap and crack open, creating the opportunity for bacteria to enter. Symptoms and signs include lameness in one or more feet, swelling and redness around the foot structure, lesions, fever and a loss of appetite. Treatment is not always successful and takes extra time and attention to be effective. Animals should be moved to a clean dry pen, where excessive movement to feed and water is not required. Cleaning of the foot and examination can provide insight into the severity. In certain mild cases, a topical antibiotic therapy can be used, however in more severe cases, a systemic antibiotic therapy protocol may be required. Another visible issue that can arise in cattle are hoof cracks. These can form both vertically up the hoof wall towards the hair line, or move horizontally along growth rings. Often times, vertical cracks occur in cattle that have excessive growth to the hoof, and have a breakdown in the integrity of the hoof wall. Continual pressure from the weight of the animal can compound the severity of the crack, if left untreated. Hoof cracks are the ideal place for manure and dirt to fill in, which can lead to further problems with infection. Horizontal rings are the result of a physiological change that causes a disruption in the hoof wall formation. Growth of the hoof wall occurs at different rates throughout the year, increasing the tendency for cracks to form. Some horizontal cracks are association with a time period of disease, reproduction changes, nutritional level, etc. In severe cases, if a crack is deep enough to cause a thickness defect, lameness can occur. Separation of the hoof wall can also occur in severe cases where mud and manure enduce a “rotting” effect behind the wall. 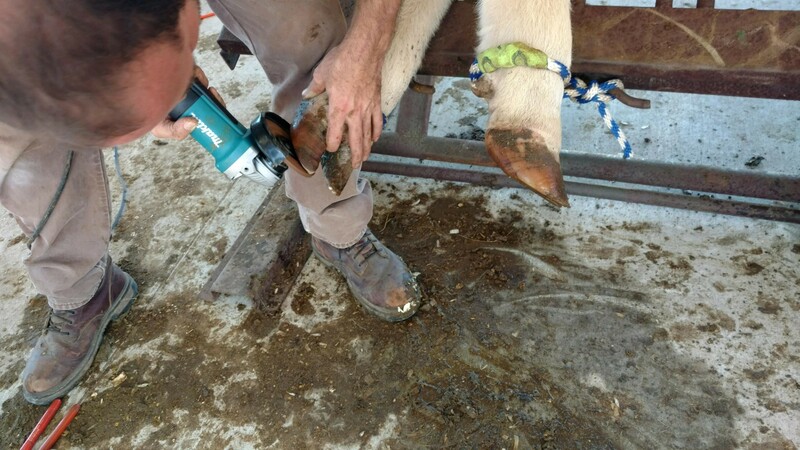 Treatment for cracks can be as simple as a quality hoof trimming with some limited mobility for the animal. Maintaining good nutritional levels can also help resolve problems that arise from cracking of the hooves. Moving up the leg you should look closely at the moving joints that are susceptible to issues in the pastern and the hock (knee). These joints bear much of the weight of the animal and should be observed for any issues. Signs of issues to look for can include hair loss on the lateral or outside skin, swelling of the joint, lesions, popping of the joint, excessive extension of flexing of the joint, and difficulty walking due to lameness. Environment plays a big role in health of joints of cattle and can depend on distance to water sources, feeding areas, number of animals in a paddock and even season; colder temperatures tend to cause joints to lock up more . It is also important to consider breeding seasons for bulls. Generally bulls are turned in with cows for a set number of days during a breeding period, and are constantly seeking female showing signs of estrus. This can be a heavy demand on bulls considering the age and number of females he is trying to cover. 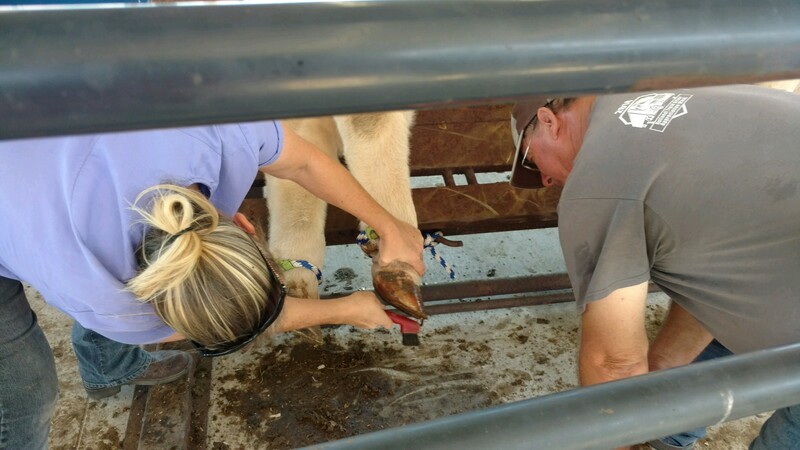 This is why it’s so important to examine bull’s feet and legs prior to purchase, and each breeding season, and throughout the breeding season. Although leg and joint issues can often times be corrected with proper therapy, prevention is the key to limiting more serious injury. High protein diets can sometimes lead to acid build up in the joints, leading to mild to moderate laminitis. Balanced rations that provide the proper level of proteins, fats and carbohydrates will also ensure even hoof growth and maintenance of fluids around the joints. The main point is to continuously observe the feet and legs of cattle in your herd. Work with your local veterinarian so they can assist with a proper protocol if any treatment or therapy is needed.